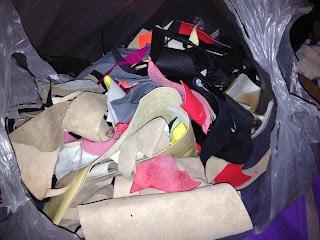 Diary of a budding model horse tack maker. On a whim I dropped them an email asking if they had any remanant or offcut bags, and was delighted to find out 500g bags are only $10 plus shipping. So I snapped one up and requested browns, as I don't have any really nice browns at the moment. A few days later I received a huge lot of leather in two shades. 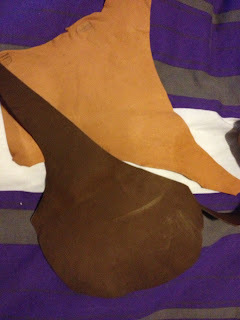 According to the colour on the website, the tanny-one is 'roan' and the darker one is 'brandy'. I think there's also some 'saddle tan' in there too though I forgot to put it in the pic. Oops. The brandy is a lot lighter in person though. It's lovely and thin - less than 1mm but I'm no expert - and with more flexibility and softness to it than my hide from Amazing Lace. It skives nicely too, although right at this minute I can't get it paper-thin like I can the Amazing Lace. But I could just need a new blade. I can't imagine using the brandy colour at any point (it's the shade that chocolate goes when it's bloomy, or like milky coffee) so will probably make up a grab bag with some other stuff I have here and sell it on MHSP. But the roan and saddle tan will definitely stay! 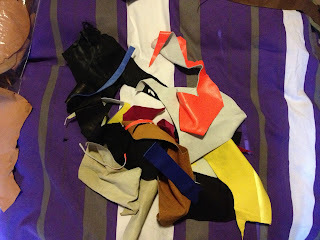 I also picked up a grab bag of scraps off ebay for $5. According to the listing it's mostly kangaroo, but I don't know what the lady was thinking. There's all sorts of stuff in here. I do think the neon might be fun! It's really thick but we'll see if I can skive that down. I'm a 25-year old girl with a sweet tooth and a camera. Here's the OF division from PEL this year. Pics after the cut!